Spinwheel Bullet Bill Base is the 9th course of Episode 1 in Captain Toad: Treasure Tracker. This level takes place in a large lava fortress. 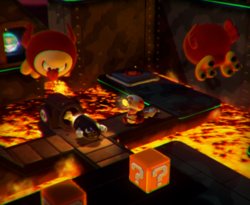 Captain Toad starts on a platform on one side of the level, and he must reach the Power Star located directly below him. From the start, the player must follow the path in front of him to reach a Spinwheel. Then, the player must use the Spinwheel to rotate the nearby stairs so that Captain Toad can climb them. From there, the player will find another Spinwheel, which will rotate the nearby Bullet Bill cannon and destroy the Rock Blocks located in the center of the course. Upon destroying them, the player will eventually be able to create a path leading to the Spinwheel near the beginning of the level (but was inaccessible from the start of the level), which will rotate the starting platform. The player can either rotate it 90 degrees to get a Gold Mushroom or 180 degrees to get the Power Star. Super Gem 1: Inside the staircase leading to the Bullet Bill cannon. Super Gem 2: Behind some Rock Blocks next to the Bullet Bill cannon. Super Gem 3: Below the second Super Gem. The player must use the Bullet Bill cannon near the third Spinwheel to destroy the blocks on the nearby moving platform leading to the last Super Gem. Spanish (NOA) ¡Rotaexplora la base Bill bala! Explore the Rotating Bullet Bull Base! This page was last edited on April 15, 2019, at 13:29.